As part of Welsh Museums Festival (27 October- 4 November) the Minister for Culture, Tourism and Sport, Lord Elis-Thomas recently visited the CC4 Museum of Welsh Cricket, based at Glamorgan Cricket’s headquarters at Sophia Gardens to present a certificate. The Museum has been awarded Full Museum Accreditation - making it the first fully accredited cricket museum in the U.K. Opened in 2012, the Museum celebrates the long and proud history of cricket throughout Wales using a series of information panels, display cases and interactive media. Indeed, the latter saw the Museum win the Kieran Hegarty Award for Innovation at the 2014 Celtic Film and Media Festival for its use of archive images in a series of digital and film presentations. 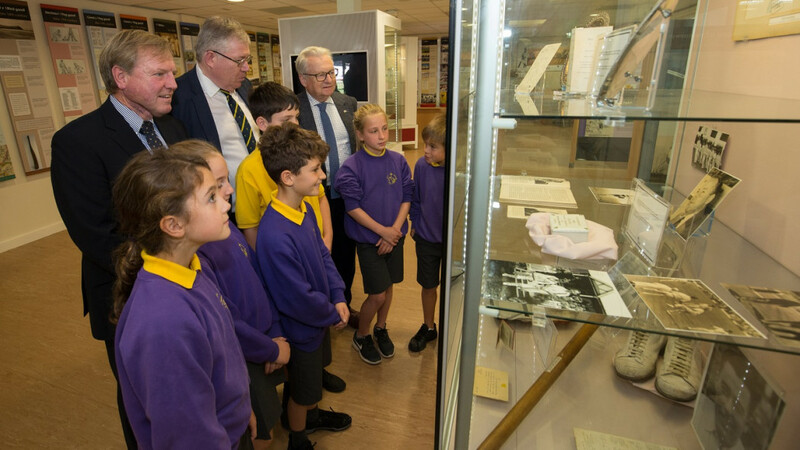 During his visit the Minister saw how the Museum highlights key dates and personnel in the history of cricket in Wales, and celebrates the achievements of Glamorgan Cricket. A special event is planned in the Museum during November in conjunction with The Royal British Legion to showcase the work which has been undertaken with local schools to commemorate those who fought, and died, during the Great War. During his visit, the Minister also spoke to pupils from Ysgol Pencae, Cardiff, one of the many school groups welcomed by the Museum every year. The Museum has significantly expanded its public engagement activities over the course of the past few years. Together with staff in the Community Department at Glamorgan Cricket, the Stadium tour guides and others with Cricket Wales, the Museum will have welcomed over 12,500 young people to the Sophia Gardens ground during 2018. There are exciting plans to further raise the number of school visits, as well as projects using cricketing memorabilia to engage with people who have issues relating to well-being and mental health. Lord Elis-Thomas, said: “I’d like to congratulate the team at CC4 Museum of Welsh Cricket - and it was a pleasure to formally announce this Accreditation which makes this museum a very special place – and unique in the UK. The Accreditation scheme for Museums, now in its 30th year, is highly valued by museums, has been transformative for the sector and has brought many benefits. Having reached this important milestone, the scheme has been re-launched to be clearer, more streamlined and welcoming.